Akuu Senki Raijin (亜空戦記ライジン, Akuu Senki Raijin?) is a scrolling-shooter game developed by Micro Cabin for the Famicom Disk System and published in Japan by Squaresoft as part of their DOG label in 1988. Often incorrectly transliterated as Akara Senki Raijin, the game puts you in control of a robot with the ability to transform to and from a jet. This gameplay mechanic is seen in The Guardian Legend, as well as Squaresoft's own conversion of Thexder for the Famicom. The player can opt to change between the two modes of their craft at certain points during each level. Upon touching ground as the mecha, the player is occasionally able to find other directions to continue exploring as a spaceship, presenting both vertical-scrolling and side-scrolling shoot-'em-up sections. 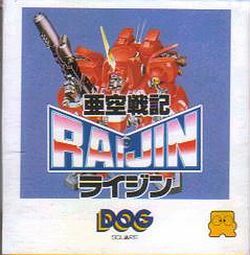 Akuu Senki Raijin (and Moonball Magic, released the same day) would be the last DOG game published - Square would exclusively focus on the regular cart-based Famicom from then on. In the year 2734 AD, the machine life "Garemu" suddenly attacked relay point five of the sub-space navigation, known as the "Field". To fend off the invasion of the Garemu, the Milky Way union has decided to engage the mobile arms mecha known as "Raijin". This page was last edited on 19 July 2013, at 01:26.